Al Ameen Boat Service is one of the well-known ferry operators based in Terengganu that provides high-speed ferry passengers service. The most popular route provided by Al Ameen Boat Service is ferry travel between Jetty Merang and Redang Island and between Jetty Merang and Lang Tengah Island. The journey between Jetty Merang and Redang Island and the journey between Jetty Merang and Lang Tengah Island usually takes about 45 minutes. Passengers are advised to check-in at least 30 minutes before the departure. The daily ferry schedules from Jetty Merang to Redang Island (at Village Jetty, Laguna Jetty, Pelangi Jetty or Teluk Kalong Jetty) are 8.00am, 9.30am, 10.30am, 1.00pm and 3.00pm. The daily ferry schedules from Redang Island (at Village Jetty, Laguna Jetty, Pelangi Jetty or Teluk Kalong Jetty) to Jetty Merang are 9.00am, 11.00am, 1.00pm and 4.00pm. 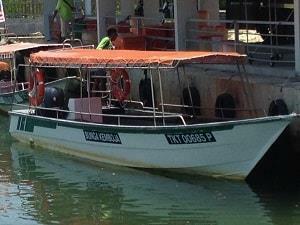 Moreover, the daily ferry schedules from Jetty Merang to Lang Tengah Island are 8am, 10am, 1pm, and 3pm. The daily ferry schedules fom Lang Tengah Island to Jetty Merang are 9am, 12pm, and 4pm. Although the ferry schedules are mentioned as above, but the timings are subject to change due to changing conditions of the sea. Travelers are advised to book the Al Ameen boat ticket in advance to avoid disappointment. For peak travelling season, at least 2 weeks advance booking is advisable. Kampung Merang, 21010 Setiu Terrengganu.